Our next client is Christy Dangas, she has been training with us Method Fitness YYC for the past year. Christy was born and raised in Saskatchewan. After graduating University in 2014 she accepted a position at Ferus, a natural gas services company. She is currently the Regulatory Affairs Lead at Ferus and LOVES the challenges, projects, and especially the people she works with. She comes from a very hardworking and amazing family who all still live in Saskatoon. Her two brothers are her #1 supporters – Christy feels very lucky to have them and many other amazing people in her life. Her hobbies include reading, volunteering, and I will never say no to a glass (or bottle) of fine red wine!! 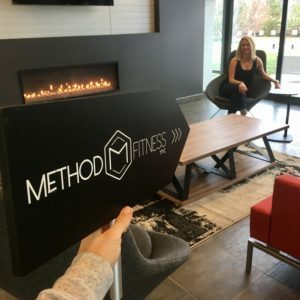 Q: What was your number one goal when starting to train at method last year? A: I needed the structure. I was always active through dance or recreational sports but I hit a slump when those activities slowed down in my life. I liked the idea of having someone build a program for me and help me achieve my goals. Q: How has your training affected your everyday life- physically and mentally? My initial intention wasn’t to drop a bunch of weight but as a result of training my body has definitely changed. I feel so much stronger both in my upper and lower body – I could walk miles in my high heels! Good physical appearance is consequential of being healthy and active- you work out, you get results and a good body. On the other hand, mental health is non-material and is worth so much more than a nice booty. My daily awareness, happiness and ability to control anxiety has seen a shift since working with the trainers at method. Q: Do you find it hard to stay on track and get all your workouts in? What are some tricks/tips you have that work for you? A: Of course. With anything in life, motivation comes and goes in waves – the key is to get through the down wave but not to beat yourself up when you do fall a bit off track. That is something my trainer Rachel has helped me through. I’m not afraid to tell her I slipped up on the weekend because we are human, we’re not perfect. What matters is that I made it to that next training session. I have my workouts in the morning so at 6AM when my alarm goes off and I know I’m going to sweat buckets in 45 minutes, I always focus on how good I feel after the workout. Some days I wake up ready to pump, but when you’re waking up before the sun it can more difficult to be motivated. It’s all a mental game for me. Q: What are some of your favorite treats? A: I can easily dummy a bag of chips and a bottle of wine 🙂 It doesn’t happen all the time, but a movie with chips and wine is the best on a Friday evening. I’ve found I’m less motivated to cheat and have unhealthy foods all the time because I’ve discovered some delicious healthy meals that I love! – A small steak with BBQ’d peppers and asparagus is one of my favorites these days!